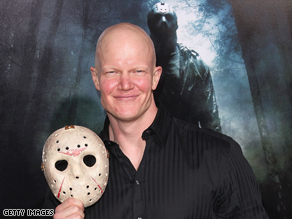 Actor Derek Mears takes on role of Jason in new "Friday the 13th"
Of iconic role, Mears says he tried to "definitely make it my own"
LOS ANGELES, California (CNN) -- Actor Derek Mears has a big hockey mask to fill. Derek Mears arrives on the red carpet at the Hollywood premiere of the new "Friday the 13th" movie. Mears was cast as the iconic boogeyman Jason Voorhees in the new "Friday the 13th" movie. A remake of the original 1980 film, the new movie aims to breathe life into the former franchise about a psychopathic killer who preys on a group of young people at the fictitious Camp Crystal Lake. Mears is no stranger to the horror genre, having co-starred in "The Hills Have Eyes II." His career is extensive and includes stints as a stuntman in two of the popular "Pirates of the Caribbean" films. He recently spoke to CNN about taking a turn as the ultimate evil, the thrill of continuing a slasher legacy and why he's really not that bloody nice. CNN: You aren't that scary in person, so what made you think you could be that scary on camera? Derek Mears: I've got a lot of issues. I've got a whole lot of daddy issues. No, I sound like a basket case. It's funny with acting -- we all wear masks in our normal life. Not to sound like a weirdo in the hockey mask, but like right now I'm really excited about the film and excited about playing the character, and I will start to speak faster. That's kind of what's coming over me: "Oh you're, you're really nice," but ... on the other side of me there are other Dereks that are angry, and like I said before, have a little bit of issues. CNN: Tell me a little bit about how you were approached. Did you know they were making it before they came to you? Was it kind of a shock? Mears: It's so weird. There's two different versions. There's my version of how it went about, and there's the producer's version. I'll tell the producer's version because my version is really, really long. The short version of my version was I heard they were doing a new "Friday the 13th," and I've never tried to pursue a role before and I went, I really want to do this. So when I heard they were doing it, before I even had an audition, I started training for it. I found out a little about what they wanted for the character -- that he wasn't going to be super, you know bulky or big, that he's more functional. He's still big, but he's lean. So I started training that way and trying to do what I could just to get an audition. On the other end, on the producer's end, they asked a bunch of different industry professionals. They said, "Hey, were doing a new 'Friday the 13th.' Who do you think would be a great new Jason?" And my name kept popping up, which I'm blown away by. They brought me in for an audition, and I met with them. and they called me the next day and went, "OK, you're the guy." And I still don't believe it till this day. I'm blown away. CNN: How did you keep it light on the set? Mears: Believe it or not, all the actors ... got along so well. I have never been so close to a cast before on set. We were just goofing around and playing, but then when it's time to work and get serious with certain scenes, we'd all switch over and do our job and get to the point where we needed to. CNN: Had you seen any of the original "Friday the 13th" movies? Mears: Oh yeah. I mean, I'm a fan. I consider myself a fan of the series. I already knew all of the originals. I had them all on DVD, and when I first met with Platinum Dunes [the production company behind the new movie], I told them, "Hey look, I'm a fan of the series first and foremost. If I'm right for the part, fantastic. If I'm not right for the part, that's OK, too. I, just as a fan, want to see a good 'Friday the 13th' film. I want to see the series continue so if I can help it, awesome, but I just want to see something good." CNN: Did you try to model your character after previous Jasons, or did you try to kind of take it and make it your own? Mears: Definitely make it my own. I used the script that Mark Swift and Damian Shannon wrote as a blueprint -- like you would for any acting role where I knew the other guys who've played "Jason" before, and what they've done, but you kind of shove that away somewhere deep in your brain and build your character from the new script. And there are times in the film here and there where I would do little tips of the hats or little homage for the guys who have played him before. CNN: It's kind of a dream come true. Mears: Yeah, that's why I keep saying the words this whole interview like "unbelievable," unbelievable because I don't believe it. CNN: Which is funny. You don't usually think of such happiness and glee [on a horror movie set]. Mears: And trust me, you won't see that in the final product. CNN's Brittany Kaplan contributed to this article.